UNITED NATIONS, December 28 -- Five days after his "purely courtesy call" meeting with Israel's Ambassador and two days after Israel's air strikes on Gaza began, UN Secretary General Ban Ki-moon on Sunday issued a measured statement through his spokesperson Michele Montas, dutifully reported near verbatim by AFP and Reuters. The latter reported that Ban "spoke with members of the Quartet of Middle East peace negotiators -- the European Union, United States, Russia and United Nations." How does UN Secretary General Ban "speak with the UN"? 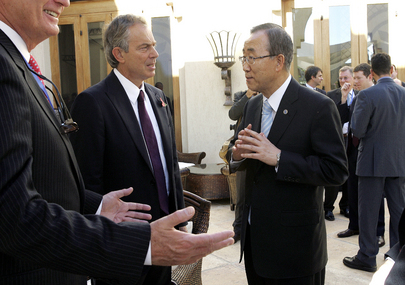 One might assume it was with the Quartet envoy Tony Blair, who last month refused to brief the UN Security Council, and has previously refused to answer questions at the UN about its competing employment with JPMorgan Chase, among others. But Blair has had little to say about the bombing of Gaza, which during his Quartet mandate he has not visit, as even as his sister-in-law has. Rather, Blair's statement Saturday focused on the political: "we need to devise a new strategy for Gaza, which brings that territory back under the legitimate rule of the Palestinian Authority in a manner which ends their suffering and fully protects the security of Israel." A member of the Scottish Parliament has asked, "Will Tony Blair - Middle East envoy? - intervene and visit Gaza to see for himself the suffering, the hospitals without equipment, and children without food and shelter?" Robert Fisk has written, "Not a whimper from Tony Blair, the peace envoy to the Middle East who's never been to Gaza in his current incarnation. Not a bloody word." Hear, hear. Footnotes: on 42nd Street by the UN on Sunday, protesters some in headscarves walked with signs such as, "End the Blockade." Inner City Press' unscientific survey of Arabic grocery store workers in the South Bronx found near unanimous support for Hamas over Fatah, adulation for Hezbollah and disgust at Egypt and others perceived as collaborators. Go figure. As previously reported, Israel's UN Ambassador Gabriela Shalev on December 23 met with Ban Ki-moon. Inner City Press asked Ban's Deputy Spokesperson Marie Okabe, at that day's noon briefing, what the meeting had been about. That the expiration of the cease fire in Gaza would have been discussed seemed obvious. The question was intended to glean whether any statement as to timing had been made by the Israeli Ambassador. "We'll get you a readout," Ms. Okabe said. Video here. "Purely a courtesy call"? That is the phrase used when diplomats who are leaving the UN visit the 38th floor for a final photo opportunity with the Secretary-General. We'll see.